18th March 2008 Amended spelling errors in March. Added the March Meeting. Chairman John, G8DET welcomed Members & visitors who had travelled from Cambridge, Gatwick, Suffolk & Kent. 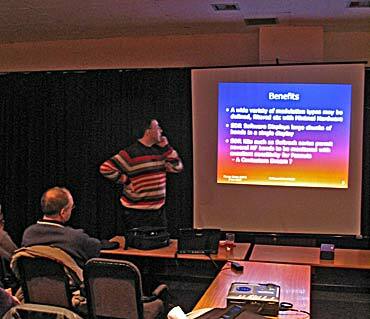 The evening started with Carl, G3PEM informing the large audience (of some 85 or so) that 3 out of the 4 candidates for the recent Advanced Amateur Radio Exam had passed. Well deserved clap. Gwyn, G4FKH then invited anyone who could transmit & receive at 15 words per minute to join him for an Advanced Morse Class. Thank you Gwyn. (Post Meeting Note: - Gwyn says "there is an excellent program which teaches and enables one to enhance their CW speed. It is "MRX" and can be found on URL http://www.mrx.com.au - and it's free"). As the Lecturer was late, Murray, G6JYB fired up his laptop & presented an Introduction to SDR. Murray's slides introduced the concept of SDR and concentrated on the Softrock RX which really started off the popularity of the technique. Peter Waters, G3OJV of Waters & Stanton arrived and apologised for being late but soon set up his computer and started by saying he was first licenced in the late 1960s. He also liked to compose music using his computer at home and said that virtually every record, CD and DVD purchased would have been produced using Music Software, mainly on a Mac computer. 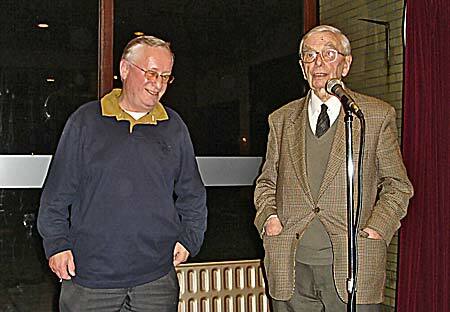 He argued that if the music industry used computers & software why did the Radio Amateurs not use it? Peter briefly took the audience on a history lesson - starting with a 100 Watt AM TX which needed a 100 Watt Modulator & big PSU - then SSB which produced the quote "throw away half the audio!". SDR was not computer controlled radio - that had been available for a number of years. The Flex 5000A was the most advanced (and expensive at £1,700) SDR available but had an impressive specification. A photograph of it was shown as W&S had sold all the stock they had! The back was more impressive than the front (just about an On/Off switch) - it contained its own purpose build Sound Card and a FET 100 Watt transmitter covering 160m to 6m and feeds the PC with a Firewire cable. Peter showed a movie clip of stored RF on his computer and demonstrated how the mouse could tune the bandwidth and the frequency. This was displayed on the screen with sound amplified by the CARS PA system with Colin, G0TRM in control. SDR Screen display - it was square on the screen on the night! To reinforce the fact that the Software of SDR is "Open Sourced", e.g. free and available for all to use, John Melton produced another Apple laptop & showed his software for the Flex 1000. This was well structured and impressive. The meeting showed their appreciation to Murray, Peter & John Melton (who then had to drive to nearby Gatwick Airport). Post Meeting Comment by Geoff, G3EDM. For those getting interested in SDR, I would recommend a read of Chapter 8 of the newly published 9th Edition of the RSGB Radio Communications Handbook. This 52 pages chapter is entirely devoted to SDR and is contributed by VK6VZ (Steve Iteland) and VK6APH (Phil Harman) who also write about SDR in RadCom (see December RadCom, p26/27 for Penelope TX). Incidentally, I have worked both of these Western Australian stations on HF using analogue equipment. Steve is especially interested in DX on 160m. He has been able to see stations on the 160m SDR bandscope display that were not even heard on an analogue FT1000 transceiver! This type of SDR display even enables you to see, and thereby read, the CW signals (and if you miss the copy first time you can replay it). What wasn't mentioned at the talks on Tuesday was the fact that you can "build" lots of test equipment using software e.g. 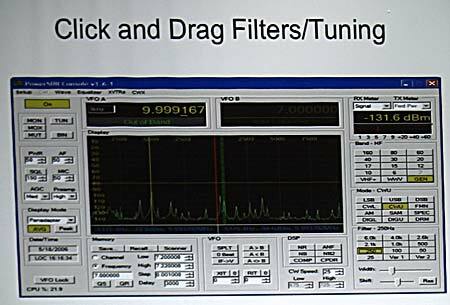 signal generators, oscilloscopes, spectrum analysers and digital filters. Another thing that can be done is that if someone is transmitting a lot of splatter you can record it and email it to him! The fact that the SDR approach to Amateur Radio involves only 1% of the hardware components of an analogue transceiver must mean the system becomes a hundred times more reliable. Although the weakness in the system is now transferred to the reliability of the modern PC which, in my experience, is less than ten years before a major fault and much less for the occasional crash. So PC reliability must improve. "A software defined radio refers to wireless communication in which the transmitter modulation is generated or defined by a computer ... and the receiver uses a computer to recover the signal intelligence (information). [My own preference in brackets]. To select the desired modulation type, the proper programmes must be run by the computer which controls the transmitter and receiver." 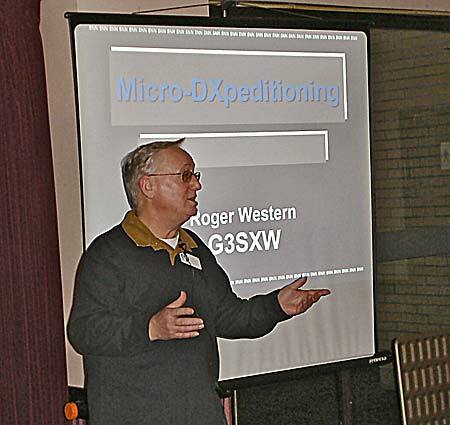 Febuary Meeting - Micro-DXpeditioning By Roger Western, G3SXW. Roger travelled to Chelmsford by train to tell us (and show us) how we can pack-up and take a small (micro) radio transmitter & receiving station to work portable. This is the opposite to DX Expeditions where 3 ton of equipment is shipped to a unique location. Roger Western. Licensed: February 1964. International Adviser to CQ World-Wide Contest Committee, CQ Contest Hall of Fame Nr 30 May 1998, CQ DX Hall of Fame May 2007. Current Call-Signs: G3SXW, G0AAA, GX0AAA, M5A. Past Call-Sign: EP2IA. DXpeditions: 3DA/G3SXW, 3X5A, 5B/G3SXW, 5U5Z, 5V7A, 9G5SX, 9H3SX, 9N1SXW, C21SX, C56/G3SXW, CN2RW, EA9/G3SXW, FH/G3SXW, FM/G3SXW, FP/G3SXW, FW/G3SXW, FY/G3SXW, GD3SXW, GJ3SXW, GU3SXW, H44SX, IS0/G3SXW, JW/G3SXW, KH2/G3SXW, OM/G3SXW, OY/G3SXW, P29SX, S79SXW, TF/G3SXW, TJ3G, TU/G3SXW, TY5SXW, TZ5A, V63SXW, VK9CXW, XT2SX, XX9TSX, YA1R, ZB2/G3SXW, ZC4SXW, ZD9SXW, ZF2WW, ZL7/G3SXW. 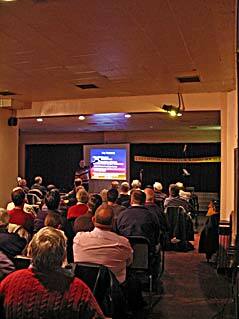 Member: RSGB; Chiltern DX Club; GM-DX Group; FOC; Torbay ARS; Central Arizona DXA; Wey Valley ARS; Echelford ARS. QSL Manager for 3X5A, 5U5Z, TZ5A, XT2DX. Author of "Up Two - Adventures of a DXpeditioner" and "Contesting in Africa, Multi-Multi on the Equator". The Chairman for the evening was CARS President, Harry, G5HF who picked up Roger from the railway station and then introduced him to the large audence. 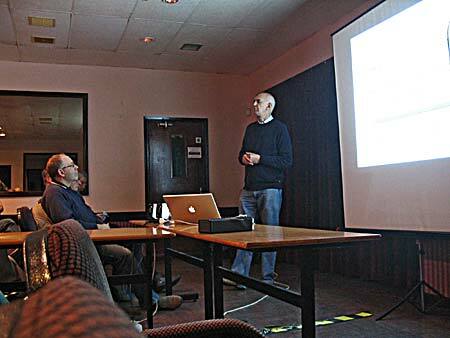 Roger provided an interesting presentation as an expert in the field. He even gave tips on how to travel to far away places and demonstrated this by saying he had been to Malta for 1p (one Penny) each way. Thank you Roger for a superb presentation & we look forward to your return visit. The high quality Raffle was organised by Tony, G4YTG. Door duties were by Geoff, G7KLV & Colin, G0TRM provided the Audio System - Thanks to both. Ceri Lowen is the Hyland House Manager & Richard Oscroft is the Vice President of Hylands House Friends. CARS Programme Secretary, Martyn, G1EFL likes to include one Social Meeting (not neccessarily Radio based) sometime during the year - this was it. The idea is to choose a meeting which Members can invite their Family & Partners to attend to meet others - we had a good turn-out. 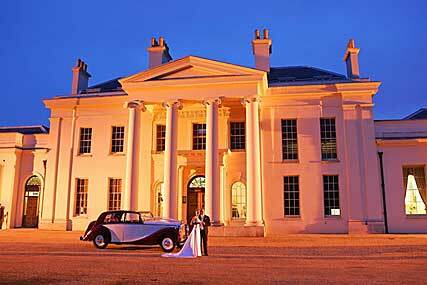 The Meeting was about Hylands House, NOT at Hylands House! After a few anouncements Richard started off by introducing himself & Ceri and her assistant. Ceri then gave a history of Hylands using nicely prepared 35mm slides from the 1600s through to to-day. Richard then took over & played a DVD of the event in July 2007 when 40,000 Scouts camped in the grounds during the GB100J event. In the audience was Doreen Pechey who was one of the 10 named Amateur Radio Operators for GB100J and she gave a few interesting stories. Our usual high quality Raffle produced 14 excellent items. Thank you Hylands House Team for an excellent evenings entertainment.